sales-i is a unique sales management software, business intelligence and CRM application designed for a myriad of manufacturing, distribution and wholesale businesses. By working in sync with your Enterprise package, sales-i highlights and delivers key insights to help grow revenue and profits within existing accounts, on PC, Blackberry, iPhone and iPad. This new view of your world liberates sales people and management by presenting knowledge and opposed to 'data', giving you the information you need, when and how you need it – across a range of platforms including iPhone, iPad and Blackberry. Spot gaps in sales, identify drift and leakage, create and deliver alerts and record CRM data to make a huge difference to the way you do business. Sales intelligence and CRM information to a range of mobile platforms including iPhone, iPad, Blackberry. Top 10 reasons why you should see sales-i today! sales-I delivers instant ROI through a simple and intuitive subscription based 'cloud' service. Comtek have developed the software to extract the information from Enterprise and update Sales-I on a daily basis, to give an up to date sales intelligence like no other package we have seen. 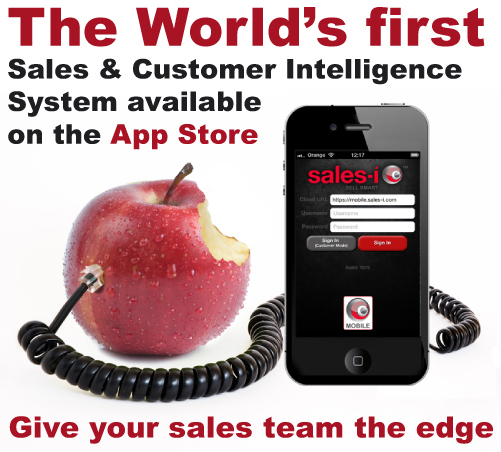 sales-i for iPhone is the first truly integrated business intelligence and CRM app giving internal and external sales teams instant visibility of customer trends and analysis via laptops and all mobile devices - now via the Apple App Store. "This is another breakthrough for sales-i as they tear down the boundaries around business intelligence and CRM; delivering an intuitive, user focused experience this time via sales-i for iPhone". Make better use of your business data by embedding sales-i into your business today." To find out more about sales-i you can visit www.sales-i.com or contact us to arrange a demo. We have provided a simple on line manual, explaining the functionality.